You take requests from the crowd, right? YES! 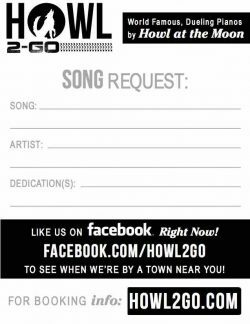 Just like in any of our Howl at the Moon venues, your guests can request any song they like, from any genre, decade or by any artist. Chances are that you or someone you know has had an awesome night out at one of our Howl at the Moon locations in the past. Perhaps you’ve been at a Howl2GO Dueling Pianos performance near where you live. One thing that always amazes our crowds is our performer’s ability to play any song thrown at them by your guests. From the newest songs of the year through to classic rock artists, our amazing piano entertainers have an encyclopedic knowledge of songs from all eras of music. Of course, the classics will never leave us – we love to perform anything by the great piano players such as Billy Joel & Elton John.